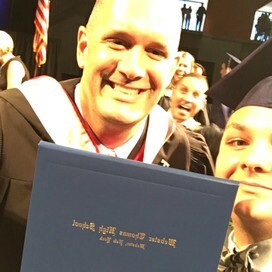 Greetings Titan Community! 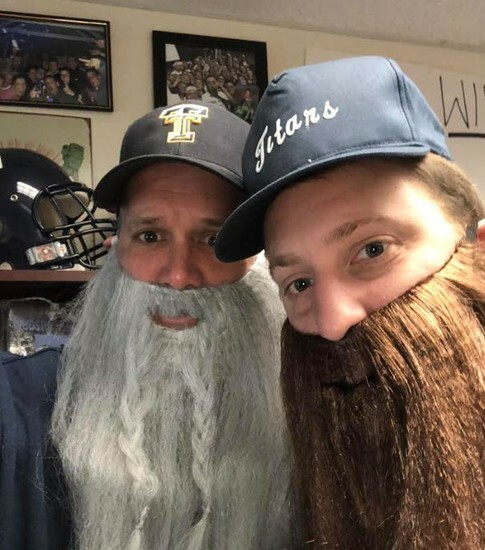 Halloween is just around the corner and the admin team is working on a good group costume theme for the year. Based on the picture above, can you guess what we will be? Stay tuned for the big reveal in a couple of weeks!!! It is hard to believe we only have few weeks left in the first marking period. The marking period will officially end on Wednesday, November 7th. Please remind your student to stay on top of their work and touch base with their teacher if they are falling behind or need assistance in any way. We are here to help! We have a ton of updates from our clubs, counseling center and athletic fields. Keep scrolling and enjoy the weekly update! Check out the following video produced about the upcoming Capital Improvement Project. The project goes to a vote in December. This video focuses on our Technology wing which dates back to the original Thomas footprint from the early 60's. Our staff and students speak very eloquently about why we have this need to serve our community. 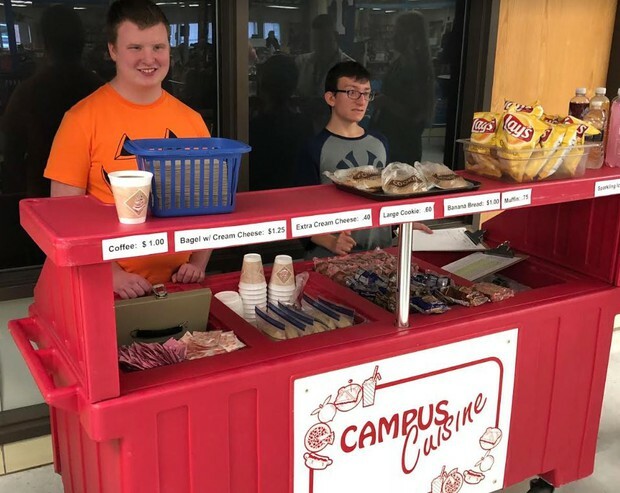 Some of our Titans are learning how to run a business and the some of the finer points of customer service through our new snack bar which was unveiled this week to the delight of our students who can now grab a quick between class snack. From 10:00-12:15, we have a mobile snack cart which will be serving all kinds of grab and go snacks and drinks for students. Thank you to Mr. Bertram, Mr. Ponitcello and their staff of interns for providing this great food option to students. Coffee with the Principal was a hit!! 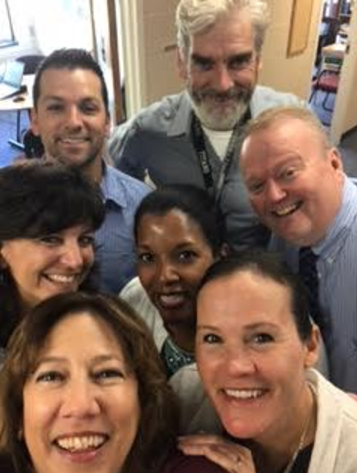 On Wednesday we had a great turn out for our first Coffee with the Principal for the school year. Lead School Counselor Sue Stacy presented on 4 year planning and reviewed freuqntly asked questions like "How does my child get into NHS?" Thank you to Mrs. Stacey, our awesome PTSA for putting on this event and all of the parents in attendance. We will be scheduling more in the future so check future newsletters for updates. Interested in a career in the Art? Are you considering a creative career? Studying art in college? If so - you should come hear from one of the art schools that recruit at Thomas! Alfred University School of Art will be here today 4th block and Maryland Institute College of Art will be here 5th. Both visits will take place in Mr. Stahl's room and you need to sign up through Naviance. Best Buddies will be meeting onTuesday, Oct 23 at 2:30 in room 147. We will be announcing our Buddy Matches and discussing the Boo Ball. If you are unable to attend please see Amy Cawley or Mrs. Green. Are you interested in volunteering and having FUN? Then come hear about the TIES Program - Together Including Every Student. Where student volunteers support peers with developmental disabilities in attending extra curricular or community activities of mutual interests. Maybe a football game, after school club, a dance, Girl or Boy Scouts or an activity being held at the rec center or Y. The TIES Coordinator will be presenting a training for interested students this Wednesday in room 103 from 2:30-3:20 (you may take the late bus home). This is a rewarding way to earn service hours and in the process promote friendships. The 5-hour class will be held Tuesday, October 23rd at Webster Thomas High School in Room 103; the class runs from 3:30 PM -8:30 PM. Cost is $52.00. Register online at webstercentral.revtrak.net. Please make sure to bring your permit to class. Juniors: Juniors have the opportunity to visit a college campus as a field trip. Please pick up your passport in the Counseling Center. You may choose from the following colleges: Brockport, U of R, RIT, St. John Fisher or Keuka. ASVAB - if you signed up for the ASVAB exam tomorrow October 20th, please arrive to the front of the building by 7:45. The exam will finish up by 10:30. The girls cross country team finished the regular season with an 11 and 2 record after sweeping Gates-Chili, Greece Odyssey, Greece Olympia, and Spencerport yesterday at Basil Marella Park in Greece. Sophomore Katherine Peterson won the race, as the Titans took the top eight places. The boys cross country team ended its regular season with a 10 and 3 mark after also shutting out the competition yesterday. Senior Mitchell Carpenter won the race, as the Titans locked down the top eight finish positions in the race. The girls beat a tough Pittsford Sutherland team Monday night. The final score was 1-0. The goal was scored by Molly Fischer. Abby Suhr recorded the shutout. They play at Eastridge Thursday in the last game of the regular season. The team had an amazing come from behind victory to end the regular season Friday night beating Monroe 28-22. Tyler Langley scored three touchdowns in the win. The team participated in the first game of the Connors and Ferris bowl Thursday night against Leadership. The game came down to the finally minute of play. Collin Hill caught a pass from Josh Jawaorowicz for the go ahead touchdown. The final score was 29-28. The team will play Brockport at home next week in the final game of the Connor Ferris Bowl. The Girls traveled to Gates Chili for the first round of sectionals Wednesday afternoon. The girls battled the elements and the Spartans the entire game. Unfortunately they were eliminated from sectionals with 1-0 loss. The Webster boys volleyball team fell in three straight games to New York State ranked #1 Fairport last night, Senior Peter Dennison was moved into a setting role and registered a team-high 11 assists, with sophomore Michael Dedee contributing an additional 10. Nick Vogt finished with 6 kills from the outside, while Sam DeGrace and Jack Willard put down 7 apiece. The boys participate in a co-ed double header Thursday, with Rush-Henrietta varsity teams coming to Webster to play a boys match at 4:30, followed by the girls at 6:15. The Webster boys volleyball Swept Rush-Henrietta in 3 games Sophomore Michael Wyant again led the defensive charge with 15 digs on the evening, while the offense was lead by Michael Dedee and Allister Spiegel's 11 and 7 assists respectively. The attack leaders included Jack Willard with 7 kills, with Spiegel and Nate Cleary registering 5 kills each. Dedee and Willard also contributed three aces apiece. Webster prepares for sectionals with one more non-league match, hosting West Irondequoit at Schroeder for senior night on Monday. The Girls travel to Irondequoit Friday to take on the Eagles. This will be their final game of the regular season. Sectionals start next week. Attention all GIRLS interested in playing Freshman, JV or Varsity Basketball. There will be a brief informational meeting on Tuesday, October 23rd in the West Cafeteria. Please see Coach Charno if you are unable to attend. Anyone interested in joining the Cross Country Ski Team come to an informative meeting on Monday 10/22 at 3:00 in the South Cafeteria.